When thinking of wood cufflinks contractors come to mind. 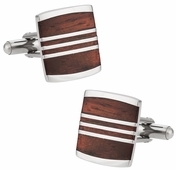 Custom builders who trim out a home with wood accents would absolutely love wood cufflinks of all styling. Not that you must be in this profession to appreciate such an element, but perhaps you also think of extraordinary builders who use wood to create pleasing decorations by carving, cutting, and forming various designs. 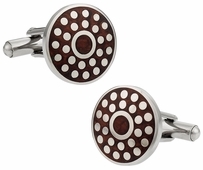 At cuff-daddy.com one of the most interesting sets that stands out is the wood and dots, in which silver has been used to create dots over a piece of rounded wood set in a silver backing and stud. Another interesting piece is the striped wood that also uses silver. In this case a rectangular piece of wood is used with two caps of silver and three stripes of silver running along the middle. 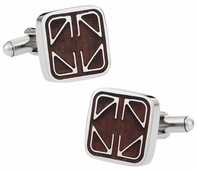 An amazing and elegant concept is the elegant wood cufflinks set in a square of metal with an overlay of stainless steel. The wood is cherry which is a lot harder to find than your average pine and thus considered one of the most elegant woods available. Another option in cherry wood is the ornate links with silver overlay in a tail fin style. It is as if four whale tales have been combined from the center going outward. 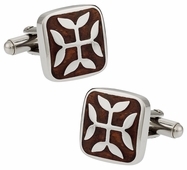 In a time, when "reduce, reuse, recycle" is the mantra, it is really nice to see wood as the featured element in cufflink design. 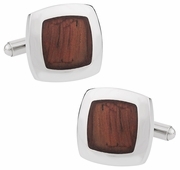 Wood cufflinks like these are true trend setters. Our designers take a veneer of authentic rich wood and skillfully place it in a stainless steel setting. Unbelievable workmanship with a truly professional result, you can proudly wear these to work or play. The best part is Cuff-Daddy has a product guarantee for product quality so you can buy these accessories with confidence. Wood is a highly decorative product that has been used for ages. Many have gone back to the roots of using wood to ensure the natural environment is no longer harmed by foul chemical processes. 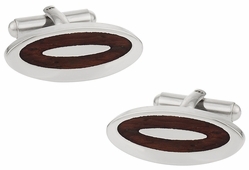 As a decorative element for cufflinks, wood can become a conversation starter or simply fit your style of preference.